"Are you going to Scarborough Fair? Parsley, sage, rosemary, and thyme..."
Since reading this book I have not been able to get that song out of my head. It has been, you'll forgive the pun, Impossible. It's all good, of course, because I've always loved the Simon & Garfunkel version, as well as Dylan's quasi-adaptation of the ballad "Girl from the North Country." 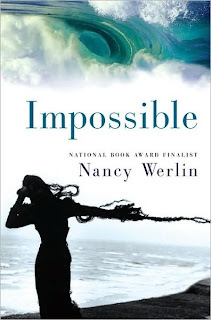 And it's good because Nancy Werlin does such interesting things developing a novel based on the lyrics. In a few words it is a contemporary suspenseful folk fantasy with some hereditary insanity, a sweet romance, and one extremely dubious (and dangerous) elven knight. Lucy Scarborough has spent her life with her adoptive parents because her mother, Miranda, is insane. Lucy manages to lead an eminently normal life interspersed with occasional random visits from Miranda, who is never really lucid beyond mumbling strange lyrics to "Scarborough Fair." But when prom night turns disastrous for Lucy it sets into motion an unbelievable chain of events and they all lead back to Miranda and an awful curse the Scarborough women have suffered under for centuries. Soon Lucy is rushing to beat the devil and save herself from insanity and her unborn daughter from sharing her unbearable fate. She is accompanied on this endeavor by her childhood friend Zack and her adoptive parents Leo and Soledad. Impossible reminded me of an end of high school version of Pamela Dean's Tam Lin. It had that same eerie, lyrical feel to it and I had similar responses to both books. I enjoyed them but felt that the characters remained somehow aloof from the reader to a certain degree, with the result that the stories as a whole felt cold. Part of this removed feeling comes, I think, from the nature of the tales themselves. They center on truly cruel supernatural beings playing wanton games with desperate, usually outnumbered humans. I've loved similar storylines, but if I can't get into the desperate humans and really root for them, it's hard to stay involved. Despite this, I did like the easy friendship Lucy and Zack shared and how their growing feelings for each other both surprised them and made them stronger. And I especially appreciated the emphasis Werlin put on humble human triumph over haughty supernatural manipulation and how true love does not cloud judgement but enables one to see clearly. I agree that Lucy and Zach's relationship is what made this book work. I wouldn't have thought of the Tam Lin comparison - that's interesting. Ok Angie, there's some weird Twilight Zone stuff going on here--I *just* finished this book last week and have a review up for it tomorrow. I really liked this novel, and I didn't feel disconnected from Lucy at all (although to a certain extent, I did feel like Zach wasn't as tangible a character)! The issue for me was how corny some of the romantic aspects were...and I'm always more than a little wary of the 'pregnant teen girl saved by marriage' kind of storyline. Still, I liked the book a lot :) Great review--and now I'll need to find a copy of Tam Lin. Biblauragraphy, I think it was the notion of tasks fashioned with no intention of the humans being able to complete them that linked the two for me. Thea, too weird! Can't wait to read your review. I think I really connected with her initially and then as the story progressed I kind of lost my grasp on her. Could have been a brain fog on my part. Loved the wedding scene, though. I think you'd enjoy Tam Lin. There's lots to love about it. This one left me feeling 'meh' - especially in light of the wonderful buzz it was getting prior to publication. I liked the characters and didn't mind how the romance was handled, but would have like more emphasis placed on solving the tasks, and wanted something - anything - more from the bad guy. Chelle, yes. I was just a bit underwhelmed. There was a lot of build up to the tasks and it didn't really feel like they'd done very much accomplishing them.